I think by now you're all familiar with my love for Ellen Emerson White's books. So you'll have no trouble understanding the level of excitement I've been living with ever since I heard she was writing a contemporary YA about the first girl to be drafted by a Major League Baseball team. Wild horses were having trouble keeping my anticipation within any sort of manageable proportions. It's difficult to believe that the release day has finally arrived, but it has, and I'm here to tell you you need to rush and grab your copy. Featuring White's trademark wit and understated class, this book is in—you'll forgive the pun—a league of its own. Jill Cafferty is pretty sure she'll go. Yes, she's accepted a scholarship to play baseball for Stanford. And, yes, she's assured her mother that if she doesn't go early in the draft she'll head off to college and accept her fate. But. She's pretty sure she'll go. What she isn't sure is which team it will be and what in the world she'll do when it actually comes time to say goodbye to her mother and older brother and go live and work with a bunch of guys. Guys who will more than likely be none too pleased to have her around. But baseball is sort of it for Jill. Her entire life has led to this point, even if the realities of being the first girl to go pro induce a level of blind panic she's wholly unfond of. But if she doesn't try now, how will she ever know if she could really go all the way? A Season of Daring Greatly is just everything I wanted it to be. I mean, every ounce of it. It resides in that unique space where young adult meets new adult, as Jill is eighteen years old and on her way to college (or the minor leagues) when our tale begins. 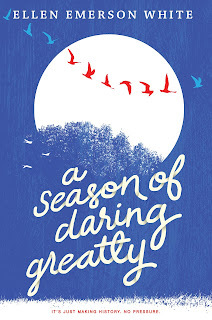 If you've read even one of Ms. White's other books, you'll have an inkling of the kind of main character you're in for, which is to say the kind of girl who is simply more in all the ways that matter. Jill is smart, driven, determined, and self-exacting. She's private, though quite open with her two closest friends. She has a healthy, if quirky sense of humor. And while she has a truly gratifying confidence and pride in her abilities, she is not without a corollary set of very real fears, doubts, and concerns. In fact, where her confidence and skills meet the pressures and fears of actually playing professional ball is where this novel shines. Like Jill herself, the book feels almost shockingly natural—as comfortable as your favorite pair of jeans, despite its unprecedented setup. Jill may be the first of her kind (and she is 100 percent/24-hours-a-day aware of that and the expectations, both fair and unfair, that come with it), but she has made a commitment. And, come hell or high water, she will see it through to its finish,whether it be in ignominious defeat or in the breaking of barriers. She's really not certain from day to day which it will be. She managed to throw a strike—a good one, sneaky fast, right on the inside corner—so, the batter swung at the next pitch, and sent a sharp grounder up the middle, which she didn't manage to get anywhere near. Terrific. That meant two runs, and—except the shy second baseman streaked over, flicked it backhanded from his glove to Raffy without missing a beat, and that was the third out. What a great play! And he'd made it look easy. She was so relieved that she intercepted him on his way off the field and couldn't stop herself from giving him a truly heartfelt hug. He looked horrified, and extricated himself, speaking so rapidly in Spanish that she only managed to catch a few phrases, most of which were along the lines of "Holy Mother of God!" So, she backed away from him raising her hands apologetically—but, still, that had been a big league play. She was practically in love with him, for making that play. Deeply in love. It felt as though a huge weight had lifted from her shoulders, and she suddenly felt so cheerful, that she almost wanted to bounce into the dugout. She paused in front of Adler, waiting for his reaction. He looked at her for a few seconds, with about eight expressions moving across his face, before settling on a small frown. "Don't hug the infielders," he said. "They hate that." I'm still grinning over that exchange. Because I am just am so fond of Jill and the team she sets on its ear. The team that also finds itself stretching enough to take her in and give her a new fabric and viewpoint from which to feel out and examine her life. While you won't be at all displeased where this novel lands, it's virtually impossible not to feel an immediate thirst for more. Please. 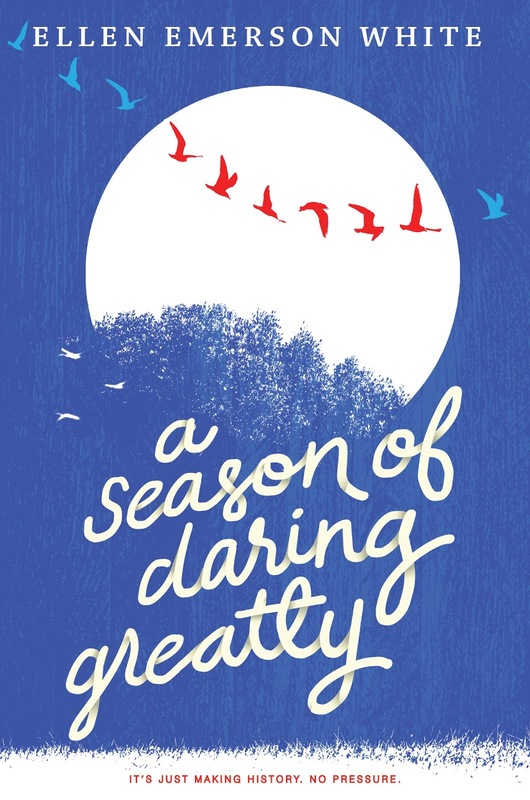 A Season of Daring Greatly is out today!